Books | Oneness Pentecostals & the Trinity | Watchman Fellowship, Inc. Contents: 234 pages, Endnotes, Appendices. A world-wide movement is assessed by a former oneness Pentecostal who warns that the time has passed for ignoring this small group. 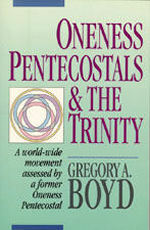 Boyd clarifies misconception that the early church believed a "oneness" gospel and carefully distinguishes the views of oneness believers from trinitarian Pentecostals and charismatics.